Having lived and worked in the DC area for the last several years, I frequently play a game I like to call “what are those people protesting?” There is almost always somebody protesting something in our nation’s capital, and, being both politically minded and occasionally nosy, I am interested in learning what could motivate people to gather for a protest. Last Saturday, thousands of people assembled in Washington DC and around the world. So, what were those people protesting? Well, that’s actually a harder question to answer than it should be considering it was a fairly well publicized event with its own website containing a “why we march” page. Really? Who are these people suppressing science or who don’t believe science is real? What American politician is opposed to developing and testing hypotheses in repeatable experiments? Anyone? No, of course not. This is little more than an attempt by liberals to turn a losing policy argument into a winning emotional argument. Just as many liberals will say the fact that conservatives disagree with them on welfare means we don’t care about poor people, they now make the claim that opposing their environmental or budgetary proposals mean we don’t believe in science. They do not care about the scientific method so much as #science, the hot new trend all the right people are adopting on social media. Bill Nye gave away the game a bit when he said “when you become scientifically literate, I claim, you become an environmentalist.” What he is saying here is that if someone disagrees with his preferred environmental policy, it is not because they think the average temperature rising a few degrees over the next century is insufficient reason to stall or possibly reverse the amazing technological advancement that has lifted billions of people out of poverty, or because they are unwilling to make massive changes based on predictions a hundred years out when those same predictions have been flawed ten years out. No, apparently the only reason not to reorient trillions of dollars and cause major disruptions to our society is because people just aren’t as smart as the former host of a children’s TV show. But let’s not just rely on the Science Guy for this. 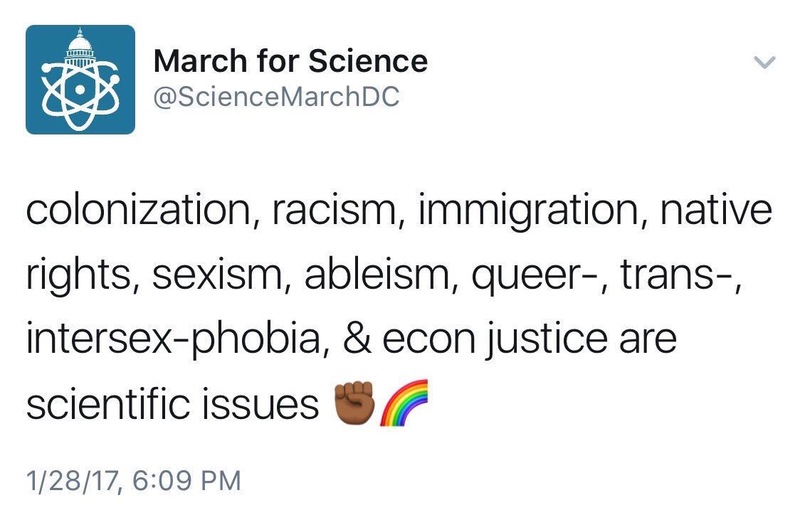 The organizers of the march made it clear that they consider science to be about advancing left-wing politics. Is racism a scientific issue? Well, I suppose so in that it was once Settled Science™ that the shape of their skulls proved that blacks were inferior to whites. Or perhaps they were referring to the former consensus among the scientific community that homosexuality was a mental disorder. But somehow I doubt it. I suspect they meant that #science supports affirmative action and a $15 minimum wage. 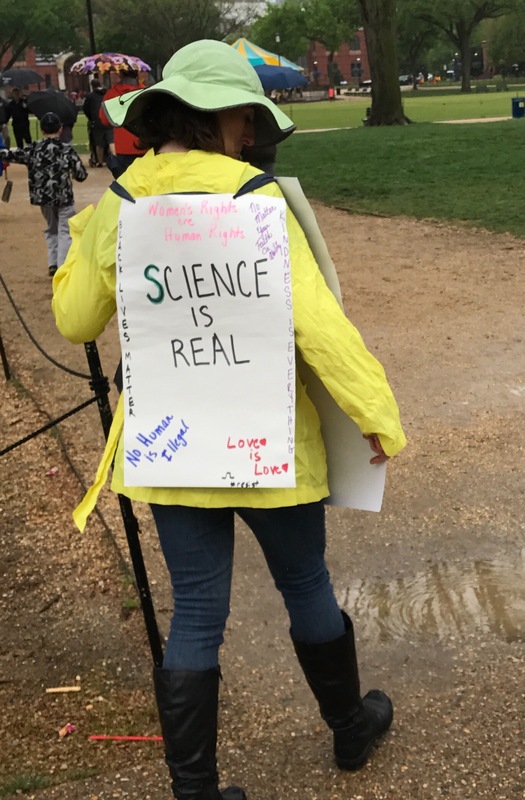 And while there were plenty of signs at the March for Science demanding science be used in public policy making, declaring that global warming is real, and denouncing “climate change deniers,” I did not see one single sign informing the world of the scientific consensus about when a human fetus can feel pain, has its first heart beat, or detectable brain waves. Where was the demand that that bit of scientific data inform abortion laws? Nowhere. The march was not really about science, it was about finding another sympathetic watchword with which to attack conservatives, because debating policy and their consequences hasn’t worked out so well for the left. ← Socialists Are Proto-Tyrants. Every. Single. One.